Life is a journey to be remembered. Our lives are important, not only to us, but also to our loved ones, and their children, and their children's children. 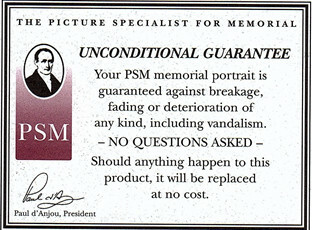 Choose a memorial of distinction to preserve your memories. A DEDO is a ceramic photo added to a monument or memorial. What kind of picture can I use? Your picture should be the clearest possible, up to a maximum of 8" x 10". The picture will be scanned and then returned to you. Please note that, unless otherwise specified, pictures will be produced vertically, cropped at the bust, with a white border. From the time of order, it will take approximately 2-4 weeks to be created and shipped. Can I add a DEDO to an existing monument? Absolutely, a DEDO can be added to an existing monument.